Here is a little voting help this midterm election. These are all issues that the political realm has debated over the last couple years. The information is out there, but if you haven’t been able to keep up on the insanity of American politics, this little cheat sheet should help. Ask yourself these yes or no questions and tally up your yes versus no at the end. Do you make less than a million dollars a year? Do you have a business that makes less than a million dollars a year? Think women are equal to men? Do you think men and women can make their own healthcare choices? Do you believe in freedom of religion? Do you want money out of politics? Do you want access to health care? Do you want to pay reasonable prices for medicine? Do you want to pay reasonable prices for health care? Do you like to breathe clean air? Do you like to drink clean water? Do you want to keep poison out of your food? Do you want to stop banks from gambling away America’s future? Do you want to hold those accountable for the Great Recession? Do you want to have decent roads to drive on? Do you want reliable electricity? Do you want the police to police? Do you want to stop the spread of Ebola? Do you want a government that actually functions? Do you want this America to progress in the world? Do you want a reasonable education? Do you want decent schools for your children? Do you want scientific advances to continue? Do you want medical advances to continue? Do you want a choice in broadband internet? Do you like Free Speech? Do you want a democracy? Do you want good American jobs? Do you want American jobs to stay in America? Do you want renewable energy? Do you want a sustainable future? Do you want to slow climate change? Do you have or want beachfront property? Do you like any place that is currently on a beach? Do you want to earn what you are worth? Do you want to be able to vote without having to pay for it? Do you think 40,000 lives are more valuable than 40? Do you want to know what is in your food? Do you want to be sure your house is not going to collapse on you? Do you think people should be able to marry who they love? Do you think that all people deserve to eat? Do you think we should take care of our veterans? Do you think we should be the best educated society in the world? Do you want to be part of the best country in the world? Do you want to help make this the best country in the world again? Do you care about the quality of your life? Do you want a better life? If you answered any of these questions then you definitely need to make sure you vote! If you answered yes to any these questions than you need to make sure that you vote Democrat or Independent. It is simple as that. Unless of course you like the government quagmire and enjoy the plummeting quality of life for Americans, then vote Republican. If you want a better America, if you answered YES to any of the above questions vote anyone other than a Republican. Doing so will help to move the government back to being influenced by the people. It might not be the perfect solution, but at least we should be able to get the slow government machine moving again and working for the people of America. Get educated and go vote. Thank you for participating in your government, it needs you! A large portion of these healthcare insurance cancellations are due to the fact that the healthcare policies that these people have are now illegal under Obamacare. They do not meet the minimum coverage guidelines set by Obamacare, the Affordable Healthcare Act. In fact these people should probably be happy about Obamacare because the new regulations stop these policies from being issued which do not cover what insured Americans think they cover. In fact, these policies were one of the targets of the new regulation because Americans had these policies, got sick or hurt, and then discovered they were not covered. They would end up responsible for the ridiculously high medical bills when they thought they were covered. Now with the new Obamacare regulations on minimum coverage, the aim is to make sure these healthcare insurance policies actually cover treatment. Before Obamacare became law, your insurance policy could be canceled if you cost the insurance company too much money. You could then be denied coverage by other insurance companies. If you were lucky enough to find a company that would insure a pre-existing condition, then the healthcare policy would be hugely expensive, effectively forcing you to risk it all, including your own life, that things would be OK. This is not a risk anyone should have to take. Now with Obamacare being law, health insurance companies cannot deny you coverage. And since healthcare insurance is now required by law, that means there will be tens of millions more people in these exchanges keeping costs down for everyone. It was a major failing of President Obama to be so staunch in his reassurance that everyone could keep the healthcare coverage they already had. President Obama knew that millions of healthcare policies would be canceled. This is a huge disappointment and goes against his promise of transparency. Unfortunately they made the choice to keep it as quiet as possible and decide to deal with the blow back once Obamacare was law. Instead of playing the “branding” game with Republicans he should have prepared America for some of the changes that would inevitably come. So in this sense, the outrage is real and earned. However, this should be tempered by the fact that now millions of Americans are not being actively deceived about the bogus healthcare coverage they had. The real outrage should be focused at the health insurance companies that sold policies that really didn’t cover people. The outrage should be focused at the lifetime payout caps that we once faced. The real outrage should be focused on the broken healthcare system in this country. Does Obamacare fix our healthcare system? No it certainly doesn’t. Does Obamacare help make our broken healthcare system a little bit better? Yes it does. My hope is through these trials and tribulations we as Americans can finally realize just how far behind we are rest of the first world in healthcare. Our healthcare is based off of making profits off the sick and injured, and ignoring the healthy. With Obamacare each one of us is going to pay a little less overall to the healthcare companies. With Obamacare we can let many of our worries go that it is no longer guaranteed to be personal and financial ruin if you get sick or hurt. However, we as Americans have to realize that our personal health and the prosperity of our entire nation are dependent on how healthy and secure we are as a people. We must realize that healthcare is a right, not a privilege. That cannot happen until healthcare becomes the national defense priority it should be. Only then will we see that socialized medicine is the only sustainable path into a strong future and healthy America. The Republicans and the GOP Leadership are using the government shutdown to take America hostage against the Affordable Health Care Act, also known as Obamacare. This can be made no clearer by this document that was sent through the house Republicans. They signed it, and made it their plan, their goal, to shut down the government. The GOP is responsible for the government shutdown, plain and simple. They want to negotiate something that they have already lost, a long time ago. They lost several elections to health care reform. They have failed to stop it with 41 separate votes in Congress. The Supreme Court of the United States of America has upheld Obamacare. This guise of the GOP compromising and sitting down to discuss Obamacare happened years ago, and Obamacare is the compromise they got. We would have a single payer system if “health care was rammed down their throat”. This piecemeal idea to funding government subverts the democratic process we have used to create these programs in the first place. They are simply taking the lives and well beings of America and Americans hostage. There is a “clean bill” that has passed the senate that will start the government immediately. It will fund everything “as is”. Just like it was before the government shutdown began. There are enough votes and support in Congress to pass this “clean bill” to get everything up and running again. John Boehner simply has to call an up or down vote and this shutdown would be over. However, he is bowing to the minority right wing tea party extremists. Eighty Republican members of Congress signed a letter which has created the government shutdown. Though they blame the Democrats and President Obama for the shutdown, it is so obvious that the blame for this extortion lies squarely with the GOP. The Democrats want to pass a budget and get the government working again, but the Republicans are trying to take advantage of the situation. 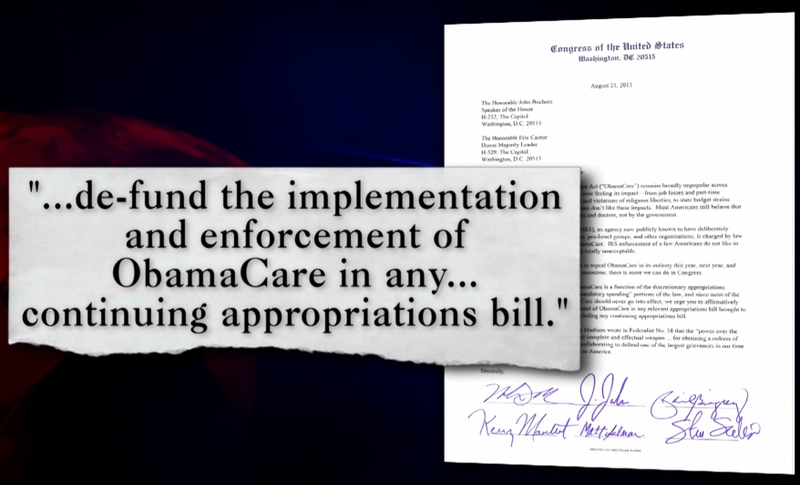 This clip from the Daily Show with John Stewart explains the letter the Republicans signed. If you would like to skip right to it, start watching at the 5:20 mark. However, I encourage everyone to watch the entire episode. It is fantastic. It’s OK for Republicans to disagree with Obamacare. It’s OK for them to have the opinion that other government programs and legislation are bad. It is NOT ok for them to take us all hostage because of their beliefs. In a democratic society you must take the majority opinion over the minority. That is the whole point. If they want to change or modify existing programs or laws they should be drafting legislation to do so. They should NOT be threatening the lives of millions of Americans or the future prosperity of America. Stop the shutdown immediately! Call a vote on the “clean bill” now. Please post your thoughts and opinions below as well as on any and all social media that you are involved with so we can get the message out that taking America hostage is WRONG. In President Barack Obama Weekly Address for 12/8/12 he urges people to push their congress to come to a compromise before America goes over the Fiscal Cliff. President Barack Obama points out a few of the highlights of what will happen if we end up going over the Fiscal Cliff if Republicans in Congress can not come to a reasonable compromise. If the recent history of the Republicans are any indication there is little hope that any compromise will be made. Here are a few of the key points of what will happen as laid out by President Barack Obama in this weeks weekly address. Tax Cuts end at the end of 2012. All Families will see a typical tax increase of $2,200 going over the Fiscal Cliff. Congress can pass tax cuts on everyone’s income up to $250,000, including those that make more. 98% of Americans would not see a tax increase. Congress can pass tax increase on income of over$250,000. 97% of American Businesses would not see a tax increase. Here is the videoof President Barack Obama Weekly Address for December 8th, 2012. Here is the Presidential weekly address for November 17th, 2012. This week President Barack Obama is still focused on the looming fiscal cliff. President Obama continues to focus on the cooperations needed in congress. Bills have already been passed by the Senate and are ready to solve this every increasing problem of the fiscal cliff but it will require cooperation from the Republican held Congress. This alone may be a long shot since the Congress has made a point of blocking and stopping anything that has come through. If you doubt this in any way look at what they did to downgrade America’s credit rating when it should have been an otherwise standard increase of the debt ceiling. Now the fear is that after holding America hostage for political gains they are going to hold the middle class and small business holders hostage.Additional public pressure will be needed to make sure that Congress becomes willing to work with President Obama. There are some signs that this might be working. It seems that this week President Obama is working to keep everyone engaged. He didn’t come out and say it directly but I think it was implied, that everyone needs to urge their Congressman to work with the President to get this financial cliff taken care of so we can move forward with repairing America. That is my take on President Barack Obama’s November 17th weekly address but I urge everyone to watch it themselves. Below is the President’s address in full.